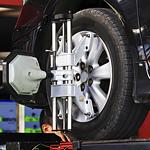 Why Should Driver's Consider a Vehicle Alignment Service? Most drivers do not even consider the vehicle alignment service until they can barely steer the car any longer. These are reasons you'll want to get this service taken care of on a regular basis. It only takes one pothole for the alignment in the car to become unbalanced. Once the alignment begins to fail, the steering becomes increasingly difficult to keep under control. If the steering is troublesome, then each time you get the vehicle to higher speeds, it becomes difficult to keep it in between the riding lanes. What is happening to the car tires is even worse. The tires are misaligned, so they tend to wear on the sides. This is a weaker area of the tread, so wear here can result in a tire failure and blowout at those higher speeds. Come to Pitre Kia of Las Cruces so we can set you up for a vehicle alignment service moving forward.